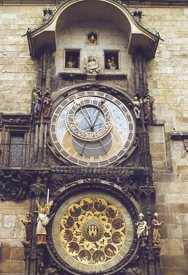 The Prague Astronomical Clock is a medieval clock in Prague, the capital of the Czech Republic. The Orloj is mounted on the southern wall of Old Town City Hall in the Old Town Square and is a popular tourist attraction. The Orloj has three main components: the astronomical dial, representing the position of the sun and moon in the sky; a clockwork hourly show of figures of the Apostles and other moving sculptures; and a calendar dial with medallions representing the months. Czech Proverbs book also available with the clock on the front cover.